After a period of time cabinets will eventually wear out. The cabinets will eventually lose their shine and the wood may even have cracks. When this happens, the cabinets will no longer look presentable, it may also become ineffective for storing goods and protecting food products from insects and pests. When this happens, a cabinet refacing project is needed. 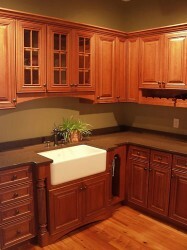 A cabinet refacing project will restore the beauty of your old cabinets. This project includes restoring the doors of the cabinet, fixing the hinges. It’s a restoration project that will bring back the look and the function of your old cabinets. With all the changes that will be done in this refacing project, then you can definitely expect it to be quite a handful. It will require time, effort and of course money. For people who do not have the time and are busy spending their effort on their work or business then sometimes the only way to get their cabinets refaced is to hire people to do it for them –which will be even more expensive because other than the materials they will have to pay for manual labor. If you have the time to do this project on your own, you will definitely save more money. All you need are materials such as basic hand tools, a table saw, cabinet veneers, new cabinet doors, laminate roller, and contact cement. The process may be quite challenging but following the procedure can help you to get through the refacing project properly. The first step is to carefully remove the old doors. You need to be working with the structure of the cabinet. The screws and the hinges should also be removed carefully. Once you’ve done this, you will be needing two types of sand paper. The first is an 80 grit sand paper, and a 200 grit sand paper. Start with the 80 grit sand paper to remove the existing paint and finish with the 200 grit sand paper. This will make it easy for the contact cement to stick and bind with the surface. Clean out the surface from particles, use a tack cloth. Next you will need a measuring tape –take accurate measurements of the frame and the face for the veneer. Cut accurately. Next you need to work on the contact cement. Apply on the frames as well as on the veneers and on the needed areas of the different areas of the cabinet’s surface. Install the veneers on to the main structure of the cabinet. Be sure to align and attach them well. To secure the veneers to the frame, use the roller. Check the veneers thoroughly and make sure there are no more cracks and misalignments. Do not allow the cement to dry before checking these so you can easily make adjustments. Now you’re ready to attach the cabinet doors. Start by installing and screwing in the hinges properly. Finally to give the new doors a luster, brush on a coat or two of wood polish. Be sure to clean the surface before coating it. Now, you can enjoy new cabinets for a more affordable price.